HJ: Relationships have a tendency to bring out the best and worst in us and for that reason, they are excellent opportunities to practice living consciously and looking within to identify and heal those wounded parts of ourselves. This article is about just that — navigating challenging moments in your relationships so that you come out stronger and more aware on the other side. There is a purpose for everyone you will ever meet. Some will test you, some will teach you, and some will bring out the very best in you. You never know when life is about to teach you a new lesson. You simply can’t plan for it. Some lessons just seem to sneak up on you when you least expect them. This is especially true when it comes to relationships. There have been times in my personal and professional relationships when I wish a lesson had come a bit earlier, to save me from heartache and the wasted time and energy of learning things the hard way. That being said, I am grateful for every lesson my relationships have taught me over the years because I am now better equipped to deal with rough patches when they arise. And that’s exactly what I want cover with you today – eight things I’ve learned to keep in mind when a relationship gets rough. These aren’t solutions to specific problems, but rather simple reminders that will help you look at many common relationship problems more objectively. 1. Every one of us is struggling in some way. It’s impossible to know exactly how another person is feeling or what kind of emotional battles they’re fighting. Sometimes the widest smiles hide the thinnest strands of self-confidence and hope. Sometimes the ‘rich’ have everything but happiness. Realize this as you interact with others, long before you pass judgment. Every smile or sign of strength hides an inner struggle every bit as complex and extraordinary as your own. It’s a sage fact of life, really, that every one of us encompasses a profound and unique set of secrets and mysteries that are absolutely undetectable to everyone else, including those closest to us. 2. Some people will put you down no matter what you do. Yes, there will be those who are critical of you regardless of what you do or how well you do it. If you say you want to be a dancer, they will discredit your rhythm. If you say you want to build a new business, they will give you a dozen reasons why it might not work. They somehow assume you don’t have what it takes, but they are dead wrong. Do not engage deeply in a relationship that is holding you back, day in and day out. 3. Resentment only hurts its holder. Holding a resentful grudge is like drinking toxic venom and waiting for the other person to grow ill. It’s an exercise in futility. And just as toxic venom is to the human body, so is resentment to the human spirit – even one tiny bit is bad for you. Don’t magnify life’s difficulties by filling your mind with resentment. Instead, ease your burdens by choosing to let them go. If you feel resentful feelings starting to take hold, stop and consider the fact that there’s nothing to be gained by bringing yourself down over what has already happened. Let today be the day you stop letting the ghosts of yesterday haunt you. Let today be the day you stop poisoning yourself with needless hatred. Forget about getting even with someone who hurt you, and instead get even with those who have helped. 4. Forgiveness is the only path to peace of mind. When someone has hurt you it’s hard to be peaceful. But you do it anyway because you know peace is the only battle worth waging. Peace is beautiful; it is the manifestation of your love and the best resolution for a brighter future. Being peaceful is hard sometimes – much harder than being angry and vengeful. It requires you to stay calm and let go of the pain. 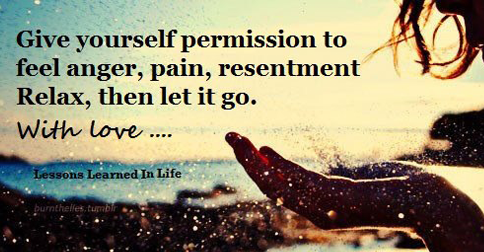 It requires you to forgive and move on. Of course, you don’t do these things just for the person who has hurt you, but for your own well-being. 5. True love is real and worth working for. Whether it’s a friendship or an intimate relationship, when someone loves you, you know it. When they look your way, the world looks better. When they say your name, the world sounds better. When they touch your skin, the world feels better. You know your soul is safe in their care. But even more so than any physical interaction, there’s a silent connection between you that you can feel in your veins. You can sit in front of them for hours, without saying a word or moving a muscle, and yet still feel them with your heart. It’s almost like they’ve always been a part of you – like a long lost fragment of your essence has found its way home. 6. It is our imperfections that ultimately attract us to each other. If you’re still searching for the perfect partner or friendship, stop. There’s no such thing. There are only different flavors of imperfect ones. In fact, you are just as imperfect as the partner or friend you seek. You simply need to find someone whose imperfections complement your own. This process doesn’t happen overnight. It takes a lot of living to grow into the realization of your own imperfections. It takes lots of life experience before you bump into your deepest inner demons, your greatest flaws, and all the idiosyncrasies that make you, YOU. And it’s only after you meet these imperfect parts of yourself that you know who you are looking for – someone whose scars and flaws fit your own – someone who’s imperfect in the perfect way for you. 7. We all bring positivity and negativity into our relationships. Be careful not to continuously doubt the positives of your partner (or friend) and then ignore your own negative behavior. You likely do this more often than you think. For instance, you will say to your partner dozens of times: Do you really love me? Are you sure? And ask similar questions that doubt the existence of their love. But you will rarely ask: Does this upset you? Are you sure? And similar questions that have the potential to resolve conflict before it starts. This imbalance creates tension on both sides of the equation. The positive things become more burdensome while the negatives fester in the background, unresolved. Bottom line: Have faith in the positives as you work on turning the negatives around, or simply accepting them. 8. Spending time alone is necessary. Relationships with others are important, but you need alone time sometimes, because when you’re in solitude you’re free from obligations and external pressures. You’re free to be YOU without being fancy and putting on a show. You’re able to hear your own thoughts and follow through with them, sincerely. Go ahead and find a quiet place. Stretch your boundaries. Explore places you’ve never been. Go so far away from what you know that you stop being afraid of the unfamiliar. All relationships, including the one you have with yourself, require patience and work. No meaningful relationship will work flawlessly all the time. Being too black and white about the expectations of what should or shouldn’t happen in a relationship always spells trouble. No matter what, there will be difficulties present, but you can still focus on the good. Instead of constantly looking for signs of what’s not working in your relationships, what you need to do is look for signs of what is. Because, as you know, what we focus on grows.